Toys for dogs, razgryzaniya sharp teeth, in a short time become useless, adding to the budget of the owner additional charges. Crafting with your hands is safe for the health of the animal toy from scrap materials, you can not only please the dog, but to avoid unnecessary expenses. Homemade toys for dogs should not only be entertaining and attractive to the animal, but is made of safe, durable materials. The size, type of filler and the shape of the product depends on the breed of dog and its age: it's unlikely the puppy breeds will need a thick wooden bar, which is so good to sharpen the cutting teeth of the dog service breeds. 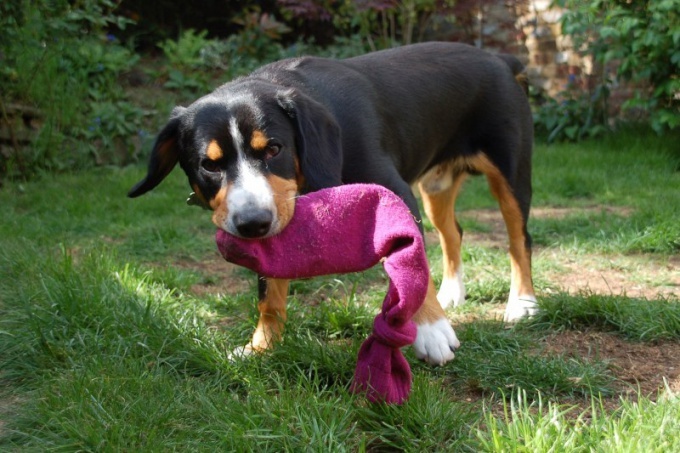 A great way to get rid of the blockage of rags or old jeans is making homemade toys for dogs. Before sewing the material should be thoroughly washed without washing powder – low odor of the host, which may be present on fabrics, in the future may cause the dog's desire to "try out" any other things that have the same scent. The simplest denim toy sewn from a cropped pant leg: one end is tied a solid knot or prestratified on the machine, after which the resulting "bag" stuffed with scraps and scraps of fabric, old, spoiled with toys, dilapidated clothes. After printing the second end of the "bag" is sewn up. The greatest interest among dogs cause a similar toy, if you as stuffing to put one or two old toys that make squeaking or any other noises. Of drape, canvas or other durable fabric you can carve out a simple toy shapes: bones, heart, diamond, etc. If the value of the fabric, fold the material in two layers – this toy will last a longer time. The workpiece is sewn on the machine, leaving a small opening for stuffing filler. The filler should be used materials that can not cause harm to the health of the dog: it is not recommended to apply the foam, padding polyester, wool and other fillers, small pieces which the animal can swallow. The best fit crop of natural fabrics: linen, cotton, denim, wool. You can also fill a few levels grains: grains during the game will rustle and attract the dog's attention. Old socks and sleeves from the clothing, baby tights, or simply sewn into a tube piece of cloth will serve as a case for your favorite most dogs plastic bottle. Large dogs, crunching the bottle, you can accidentally swallow bits of plastic, able to hurt the sharp edges of the esophagus or cause intestinal blockages. Plastic, securely hidden in a kind of cover, safe for animals and causes no less interest than the bottle. Even more entertaining like a toy will make small crackers or pieces of dry food, pour in a bottle: the filler will attract the dog's attention not only by sound but also by smell. It is important to remember that before using a plastic bottle as a toy, it is mandatory to remove the cap and o-ring. No less interesting option for a homemade toy is a solid piece of wood, lined with cloth, undyed leather or wrapped in old socks. The wood must be durable and does not secrete resin. The most preferred games are pieces of wood from maple, walnut, ash or birch.